Many professionals with education and opportunity have fled Zimbabwe. TNC provides support to insure that a doctor is appointed to the Nyadire Hospital and also enables numerous medical projects and programs. 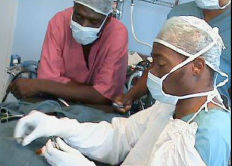 Examples include equipping of a surgical theater, advanced nurse education, specific equipment provision or repair, etc. Contributions to TNC to help with this ongoing expense are needed.